Path hopes to bring close friends a lot closer. Launching today, the new social network is calling itself a “personal network” and is only intended for you and your closest friends and family. It is only available on the iPhone–trying to log in through the web will lead to a terrible dead end, devoid of content or any way to add friends. From what we currently gather based on research and web use alone (we will try the iPhone version soon), the service is more about photo sharing and tagging with smartphones. You take a picture, tag who is in it, say where it is at, and what the picture is showing. Then your friends log in and can “see” that picture. When they look at it, Path tells you that they ‘saw’ it. 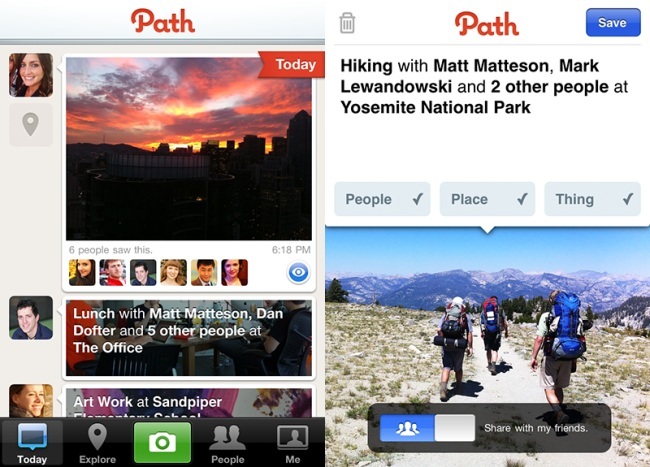 Eventually, Path hopes to connect up your pictures and show you how they all link up in new and unique ways. Unfortunately, that’s about all there is to it. There is no commenting on photos, no cropping or editing photos, no walls, no messaging, no status updates, no Flickr or other service integration, no smart searching, no reposting photos, no liking, no favorites, no thumbs up/down, nothing. Apparently, Path believes you are so close to your close friends that you all don’t need to communicate at all. Is Path a good idea? It seems like a gimmicky way to attract Facebook users who are scared about privacy, but lacks any of the features those people are accustomed to. If you have an iPhone, download it from the App Store and let us know what you think.